UPDATED: Sat., June 3, 2017, 2:42 p.m.
ROME – Juventus fans watching the Champions League final rushed out of a Turin piazza in panic Saturday after witnesses reported hearing a loud sound. At least one person was carried away on a stretcher and medics treated fans in the square for cuts and other injuries sustained in the near-stampede. Thousands of people had gathered in Piazza San Carlo to watch the match pitting Juventus against Real Madrid on giant TV screens. At a certain point, hundreds ran from the center after some reported hearing a loud sound, an explosion or a shot, said Associated Press journalist Brian Hendrie, who was in the square. 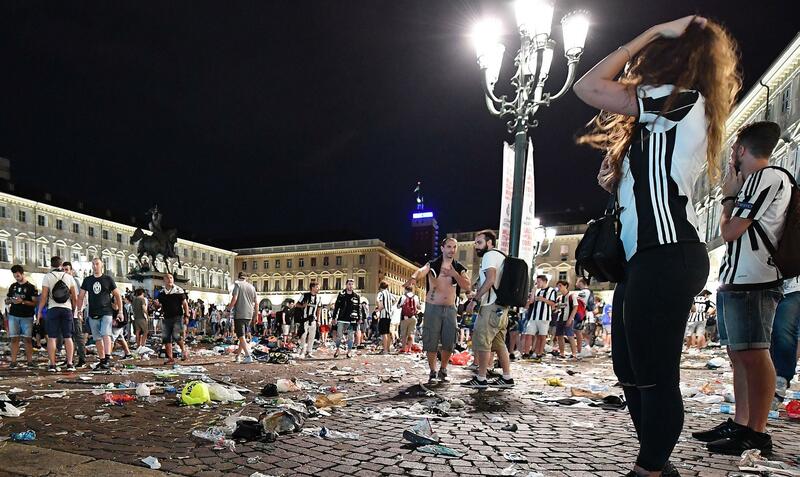 Within minutes, dazed fans in Juve’s trademark black and white jerseys returned and milled about the piazza amid the broken bottles and garbage littering the cobblestones. Real Madrid won 4-1 in the match played in Cardiff, Wales. Published: June 3, 2017, 2:03 p.m. Updated: June 3, 2017, 2:42 p.m.